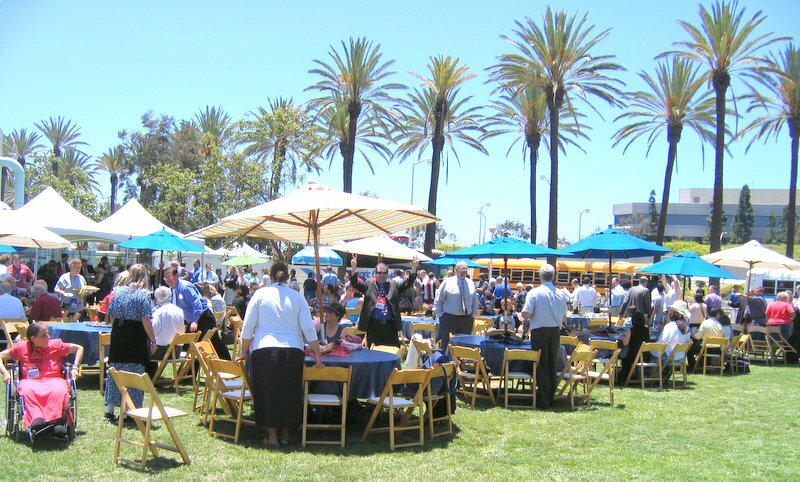 Yesterday afternoon we had a banquet on the lawn of the Aquarium of the Pacific. It was a fancy catered meal. We had dinner rolls, chicken breast, baked beans, tortillas, corn on the cob (probably the best I have ever eaten), fajitas all followed up by ice-cream novelty bars. We then had free reign of the aquarium. It is not an overly large aquarium, but it was nicely laid out. They made good use of their space. I then left the group after a quick run through the fish and headed out on my own. Though I have some good friends here, they all had much tighter relationships with this particular group. Some of these pastors and attendees have been meeting together annually for 27 years. This is my first time to attend this conference. I am definitely the outsider. So, I did not feel bad about taking off and leaving everyone behind. Just outside of the aquarium area is a large shopping complex. It is not quite like a mall, more like an outlet store complex, except the stores are not outlet stores. A big jumble of just about anything high end. One of the more interesting stores I saw was the Segway store. You could rent a Segway for a few hours or all day. They were also a dealership. For $6K you could have a nice decked out machine. I then buzzed over to Borders Books. I was pleasantly surprised by something that I had not experienced in a while. I went into the bookstore with my backpack. Being a good Mexican, I went right up to the front counter and asked them where I needed to store my bag. The lady looked at me funny and said that I did not have to leave it at the desk. That was a surprise to me after living here for 3 years. Every store here has a package counter where you have to drop off your carry in items before entering the merchandise area. I was suddenly brought back to a thought that I had 3 years ago, but had forgotten. Here in Mexico (at least in the stores) it is assumed that everyone is a thief. In the US, it is assumed that no one is. The truth is that in the US there are more high tech ways of catching someone at shoplifting than there are here. So you are still assumed to be a thief in the US, but as a regular consumer, you just don’t notice it. I then made my way back to the church and asked for directions on taking the metro train/bus back to my hotel. One thing I have learned in Mexico is that you don’t ask someone for directions if they are walking. They are walking because they don’t drive. I should have used that knowledge to help me get back to my hotel. I asked a man in the church how to take the train/bus back to the hotel. Don’t ask someone who drives for directions on how to use public transportation. He told me to buy an “all day” ticket when I got on the train. That would allow me to get on and off as many times as I needed for the day. Then I could use the same ticket to take the bus from the train station to my hotel. Not quite true. I ended up paying for 3 train rides (though I only rode once) buying that ticket and still had to pay for the bus. There is an all day ticket for the bus too. But, they are two separate systems. So you have to pay a fare on each. I got back to my hotel just fine though. I had a bit of time to get ready for my sermon that night. I was pleased that, even though I was not originally on the speaking schedule, they let me preach. The man that I was supposed to serve as interpreter was not able to make the conference. Therefore, they let me speak in his place. It was an honor. That sounds like a nice ending for a pleasant event. Would I know any of the people that was at the event? So how many books did you steal from Borders? That’s pretty cool about being able to do the sermon. I guess that you have a few that are ready to go at a moment’s notice or do you shoot from the hip. Also, inquiring minds want to know… how often do you include running anecdotes into your sermons? No stolen books. Or, at least, not that I am confessing to. That�s pretty cool about being able to do the sermon. I guess that you have a few that are ready to go at a moment�s notice or do you shoot from the hip. They actually told me Tuesday that I would be speaking on Thursday, so it was not as short notice as it sounds. However, I am driven by deadlines. I usually don’t get anything prepared more than a few milliseconds before it is due. I did happen to preach something a couple weeks ago at my church that was very fitting for this week. So I just dusted it off and polished it up for the occasion. how often do you include running anecdotes into your sermons? Hmmm? Good question. So far I can think of only once using a running illustration. I am not a closet runner, obviously you all know I am passionate about it, but yet I don’t really talk about it except for here on the blog and with my family. My family probably wishes I would start talking with others so that I would leave them alone.